This is my version of the popular South Indian curd rice. It is called dahi bhath, thayir sadam, masar anna, and perugu annam depending on which part of the country you come from. I’ve used Basmati rice, plain whole milk yoghurt, and heavy cream in my recipe. I bought the yoghurt that I used for this recipe from the Indian grocery store, but you can also use whole milk yoghurt from the regular grocery store. Just make sure that the yoghurt is not flavored. In my version, I did not mash the rice as I like to keep the grains whole. To some of my readers, this may not sound like the traditional curd rice recipes from South India, but I like the creamy, comforting, distinct flavor of this rice dish, and I hope you will too. 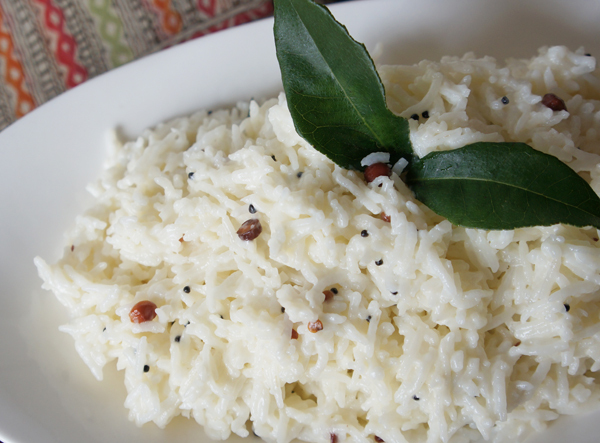 A South Indian meal often ends with curd rice. It has a calming effect on your digestive system after a spicy meal. You can also use leftover rice to make this dish. Serve it with pickle, chutney, or a simple vegetable dish. Put the rice in a medium bowl and add enough water to cover it. With your hands gently swish the rice so as to release the excess starch. Pour off the water and repeat four or five times until the water runs almost clear. Drain in a colander. Put the rice in a small saucepan along with the water and salt. Place the saucepan over medium-high heat and bring the water to a boil. Reduce the heat to low, cover, and simmer until all the liquid is absorbed, about 15 minutes. Turn off the heat, remove the lid, fluff the rice with a fork and let it cool to room temperature. Beat the yoghurt with a fork until creamy and then stir in the heavy cream. Once the rice has cooled completely, add the yoghurt-cream mixture. Mix well and set aside while you prepare the seasoning. To season the rice, heat oil in a small frying pan over medium heat until shimmering. Add mustard seeds, and when they pop add the split bengal gram dal. When it turns light brown add the black gram dal and fry until it also turns light brown. Add the curry leaves, green chilli, and asfoetida. Fry for 30 seconds. Turn off the stove and pour the seasoning over the rice. Mix gently so the rice is well flavored with the seasoning. I’m lucky to have one of my nephews living close by. He recently dropped some groceries to my home and said, “Aunty, I see that you are cooking a lot because of your new website, so I thought I would bring you some ingredients!” Thank you, Eddy! Among the ingredients he brought was a box of Nutrela Soya Chunks. It is made by Ruchi and comes in three variations – soya chunks, mini-chunks, and granules. It is known in India as Soy Mealmaker and it can be purchased at Indian grocery stores or even from Amazon.com. 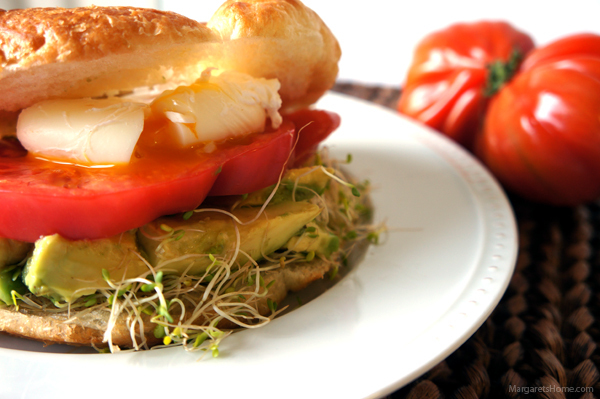 It is an excellent source of protein and a great alternative to meat for vegetarians. I use soya chunks to replicate non-vegetarian dishes. I find that it takes on the taste and flavor of the spices and vegetables that I add. The first step in preparing Nutrela for cooking involves soaking the chunks in warm salt water for ten minutes. You can omit the salt if you intend to make a sweet dish or if you have salt restrictions. The second step involves draining the water and washing the chunks until the water runs clear. 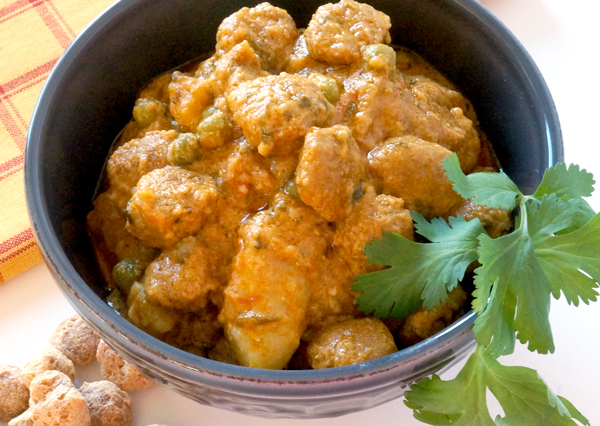 Squeeze the excess water from the chunks and it is ready for you to use in your curry. Here is a recipe that I tested yesterday. Pulse onions, ginger, garlic, chillies, and cilantro in a blender and process until it is ground. Scrape down the sides of the blender once during the process. Heat oil in a pan over medium heat until shimmering. Add the whole spices (garam masala) – cloves, green and black cardamom, bay leaves, cinnamon, and cumin seeds. When the cinnamon stick unfurls and the cloves and other spices pop add the ground onion mixture. Cook stirring until fragrant, about five minutes. Next add the tomatoes and cook, stirring frequently, until the liquid evaporates and the oil separates. Add the chilli, coriander, turmeric powder and salt. Stir for 30 seconds and then add potatoes, peas, soya chunks, and stir in the vegetable stock. Bring to a simmer over medium heat and cook for 10 minutes or until the potatoes and peas are done and the curry begins to thicken. Add the yoghurt, reduce the heat to medium-low and cook for another seven minutes. Your delicious, protein-packed curry is ready to be served with steaming hot rice. Growing up in Pune, Maharashtra, my family often traveled by train to Mumbai. Traveling by train was always exciting. Whenever we stopped at a station, I would scan the platform, looking for the puri-bhaji and aloo bonda walas (vendors). Puri-bhaji is a quick and satisfying fix for hungry travelers! I remember relishing every bite – an integral part of our trip’s adventure. And as the train pulled away, we eagerly awaited the next station for dessert – the famous Lonavala chikki. Simple pleasures are what some of my memories are made of. 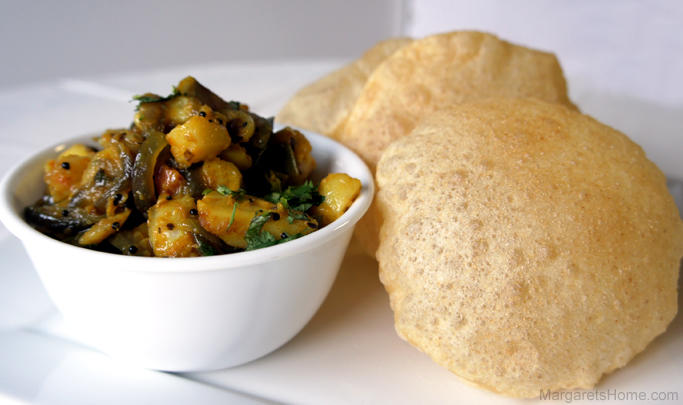 Today, I am sharing a recipe for puris and bhaji. Puris are whole-wheat deep-fried bread, and bhaji is a potato side dish that often accompanies puris. 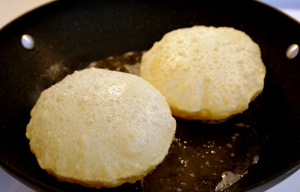 Puris and bhaji can be served as a meal by itself or individually as side dishes. The main ingredients for bhaji are potatoes and onions. I’ve spiced my bhaji recipe with a twist on the train platform offering. Hope you like my version! Put the wheat flour in a large mixing bowl, and make a well in the center of it. Add two teaspoons of oil. Mix the flour, and oil well. Add salt to the warm water, and add it to the flour. Knead to make a stiff dough. Divide the dough into 20 equal sized balls. Cover with a damp paper towel, and let it rest for 15-20 minutes. Heat oil for deep frying in a heavy bottomed wok. With the help of very little dry flour roll each ball into 4” diameter diskettes. Cover them with damp paper towels until all the puris are made. Deep fry on medium-high heat until light brown on both sides. Heat oil in a large pan. Add mustard seeds, and when they splutter add cumin seeds. Lower the heat to medium, and add the yellow split peas, and wait for a minute until they they turn light brown. Add the spit black gram, stir until they also turn light brown. Then add the curry leaves, ginger, green chillies, onion, salt, and turmeric. Saute until the onion turns transparent. Add the tomato, and saute for another two minutes then add the diced potatoes. Mix gently, cover the dish, and let it cook over low heat for five minutes. Serve garnished with chopped coriander. Happy New Year, friends. I wish each one of you peace, happiness, good health, prosperity, and good eats in 2013! Some of you asked me to post a recipe for namkeen. Many of my recents posts have been Indian sweets, and that is because I have an insatiable sweet tooth. Namkeen is a snack that most Indian homes make for tea-time. This recipe is easy, and the namkeens are infused with nigella (kalonji), carom (ajwain), and cumin (jeera) seeds giving them a distinctive, and peppery twist. 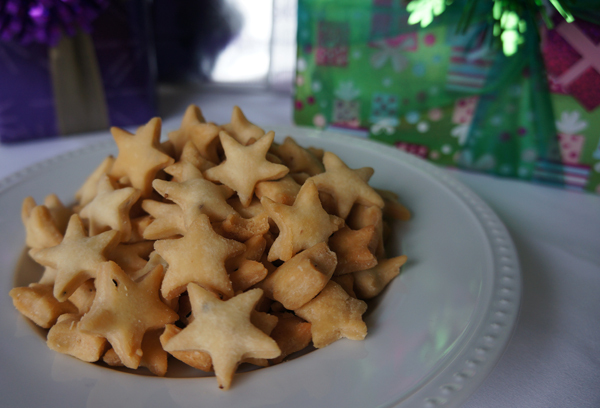 For Christmas, I used a star shaped pastry cutter to make the namkeens shown in the picture. But you can also cut them in diamond shapes with a karanji or pizza cutter. I hope your namkeens turn out well. Sift flour, and salt into a large bowl. Make a well in the center of the flour, and salt mixture, and add the oil. In the palm of your hands, lightly crush the nigella, carom and cumin seeds, and add them. Mix the flour, salt, oil, and seeds until the flour is crumbly. Then add water, a little at a time, to make a stiff dough. Cover with a damp towel, and let the dough rest for 20 minutes. Divide the dough into three parts. Knead each portion again, and make a smooth ball. Roll each ball into a circle that is ¼ inch thick. Cut into diamond shapes. Or, use a small star shaped pastry cutter to cut out little namkeens. Heat oil in a wok (kadai) over medium-high heat. When you drop the namkeens in the oil they should drop to the bottom of the wok, and come up to the surface of the oil slowly. Each batch that you fry will take at least 10 minutes. Fry the namkeens until they are light brown on both sides. Drain on paper towels, and cool completely before you store them in an airtight container.